Home » Jesus » Did Jesus Rise from the Dead? Christ's Appearance to Mary Magdalene after the Resurrection by Alexander Andreyevich Ivanov (1806 - 1858) – Painter (Russian) Born in Russia, Moscow. The death and resurrection of Christ are the foundational events of the Christian message (1 Cor. 15:1-4). The apostle Paul made it clear that Jesus’ resurrection is the decisive issue in whether Christianity is true or false: “If Christ has not been raised, then our preaching is in vain and your faith is in vain” (1 Cor. 15:14). This means that the Resurrection cannot be treated as a beautiful myth that expresses some profound truth about the human condition even if it did not actually happen. Paul frankly stated that if Jesus had not risen from the dead, then he and the other apostles were liars (1 Cor. 15:15). The historical question is thus forced upon us: Did Jesus really rise from the dead? Although the resurrection of Jesus is very much a disputed, even hotly debated matter, two historical facts of relevance should be regarded as beyond reasonable doubt: that Jesus was a real historical person, and that he died on the cross. These facts are acknowledged by a wide spectrum of historians and other scholars of various religious beliefs as well as those who are skeptical or secular in their approach to the subject. Fact #1: Jesus really existed. Obviously, if Jesus were a mythological figure, then his resurrection would be a myth. However, as we showed in part 1 of this series,1 there is no evidence against the historical existence of Jesus and plenty of evidence for it. Jesus is attested as a historical figure not only in Christian writings dated only two or three decades after his death (an extremely short time for any figure in antiquity) but also in the writings of the Jewish historian Josephus (late first century) and the Roman historians Tacitus and Suetonius (early second century). Bart Ehrman, probably the best-known New Testament scholar in America today, although he is an agnostic, wrote an entire book refuting the claim that Jesus was a fictional character borrowed from ancient pagan myths. “The reality is that whatever else you may think about Jesus, he certainly did exist.”2 Despite the existence of tens of thousands of scholars with genuine academic degrees who do not believe in Christ, you can count on one hand the number of such scholars who have published works today denying that Jesus existed. The fact that Jesus actually existed is no trivial point here. As surprising as this may sound, one of the most popular theories advanced by skeptics today to explain away Jesus’ resurrection is to claim that he never even existed. It is reasonable for skeptics to assign Christians some burden of proof to show that Jesus rose from the dead, but it is entirely unreasonable to demand Christians prove that Jesus existed. The burden of proof in that regard is wholly on the skeptic. Fact #2: Jesus died on a cross. Only slightly less absurd is the claim that Jesus didn’t die on the cross and therefore didn’t rise from the dead. The logic is simple enough: If Jesus wasn’t dead, he could not have been raised from the dead. This claim, which has taken several different forms, is by far the most common objection that non-Christians make against belief in the Resurrection. Muslims commonly believe that Jesus wasn’t crucified at all—they usually suggest that someone else was crucified in Jesus’ place—while some skeptics have thought that Jesus was crucified but somehow survived the ordeal. With just these two historical facts that Jesus was a real human being and that he died on the cross, we have eliminated the most common theories offered by non-Christians regarding the resurrection of Christ. No position on the subject that discounts either of these two facts deserves to be taken at all seriously. It is not rational to reject Christianity by claiming that Christians cannot prove with absolute certainty that Jesus existed or that he died on the cross. Rather, it is up to the skeptic or the advocate of another religion to show good cause for disputing either of these facts. and that he appeared to Cephas, then to the twelve (1 Cor. 15:3-4 ESV). The belief that Jesus rose from the dead is not to be confused with the idea of a person’s soul or spirit continuing to exist in a spiritual or heavenly realm. The Christian message is that Jesus died and then came back to life in his human body, now transformed with immortality and glory (Rom. 6:9; 1 Cor. 15:44-49; Phil. 3:20-21). The sequence of events Paul lists here, death—burial—resurrection—appearances, clearly means that the dead body that was buried was then raised from the dead. If that is what happened, then that dead body, of course, could not have remained in its grave. After Jesus had been raised from the dead, Paul says that Jesus appeared to various persons. In context, Paul’s point in mentioning Jesus’ burial and especially his appearances is to emphasize that Jesus’ resurrection was something that actually happened in which his body died and then was brought back to life. If Jesus’ grave did not become empty and the appearances didn’t happen, then the Resurrection was apparently a legend or myth, a story that was invented about Jesus. If Jesus’ grave did become empty but no one saw Jesus alive afterward, then we may infer that Jesus’ body was either moved from its grave or that those who reported the body missing had gone to the wrong location. The idea that Jesus had risen from the dead would have been a misunderstanding made possible by the empty grave. If Jesus’ grave did not become empty but the appearances took place, then we may infer that those who reported the appearances experienced hallucinations or religious visions but did not see Jesus bodily risen from the dead. The explicitly corporeal aspects of the appearances reported in Luke and John (people touching Jesus, watching him eat fish, and so on) would need to be explained away as later embellishments once those visions had been misunderstood as resurrection appearances. If Jesus’ grave did become empty and people had experiences afterward of seeing Jesus alive, then the best explanation for these two facts together is that Jesus rose from the dead. With rare and exceedingly implausible exceptions, these four scenarios account for all of the various theories that acknowledge the death of Jesus on the cross and that try to account for the origin of the belief that Jesus rose from the dead (see also the table below). We turn, then, to consider the two questions of the empty grave and the appearances. Fact #3: Jesus was buried in a rock tomb and that tomb was later discovered empty. All four Gospels report that Jesus’ body was buried in a tomb owned by Joseph of Arimathea, a member of the Jewish high council (the Sanhedrin), and that some women who knew Jesus personally went to that tomb and found it empty. A minority of biblical scholars disputes this report, but there is substantial evidence to support it. A Sanhedrin council member as the owner of the tomb. Second, Christians inventing an empty tomb story would not be likely to credit a member of the Sanhedrin, which had handed Jesus over to Pontius Pilate to be executed, with having provided the place for Jesus’ burial. Bart Ehrman, the agnostic scholar mentioned earlier, argues that the Christians who invented the story of the empty tomb were forced to say that the Sanhedrin buried Jesus because no one else could have done it. How does Ehrman know this? He points out that, according to the Gospels, “Jesus did not have any family in Jerusalem,” his disciples “had all fled the scene,” and the Romans would not have given a crucified criminal a decent burial. Supposedly, then, by process of elimination the storytellers who came up with the empty tomb fiction were forced to attribute the burial to members of the Sanhedrin.6 Notice what Ehrman has done here: He has appealed to certain elements of the Gospel accounts (no family in Jerusalem, the disciples had fled after Jesus was arrested) as though there is no question about their historical accuracy in order to call into question the historical truth of another element of the Gospel accounts (the burial by Joseph of Arimathea). However, if the Gospel accounts are fiction, why not invent a rich friend other than a council member living in Jerusalem to bury Jesus, or make up a story about one brave disciple who didn’t run away but stayed and made sure Jesus’ body was buried? Burial by a rich friend living in Jerusalem would not have been a stretch, since the Gospels report that Jesus and the disciples had their meal the night before his death in the large upper room of a home in the city (Mark 14:13-15; Luke 22:10-12). Evidently, the account of Jesus’ body being buried in the tomb of a member of the Sanhedrin was a somewhat embarrassing fact that the Gospel writers did not feel at liberty to replace. Ancient and modern critical theories that concede the empty tomb. Third, the earliest explanations for the Resurrection story offered by opponents of Christianity conceded the empty tomb. The theories that the disciples stole the body (Matthew 28:11-15) and that someone simply moved the body (John 20:2, 13) obviously were non-Christian attempts to deny the Resurrection. Yet both theories concede that Jesus had died, that his body had been buried in Joseph’s tomb, and that the tomb was found empty. These are rather important concessions. They show that the skepticism of some modern scholars with regard to the burial of Jesus in a tomb was not shared by people in the first century. Hardly anyone today advocates the theory that the disciples stole the body. Even if one doubts Matthew’s report that the tomb was guarded, the disciples simply had no motive for stealing the body. In recent years, on the other hand, the theory that the body was simply moved to another tomb has been revived. In 2007 a Discovery Channel documentary and companion book claimed to have discovered the tomb of Jesus and his family.7 The tomb contained several ossuaries—stone boxes in which the dried-out bones of the deceased were placed—with named inscribed on them. Those names, according to the documentary and book, included “Jesus son of Joseph,” “Mary the Master,” “Judah son of Jesus,” and “Maria.” The documentarians, Simcha Jacobovici and Charles Pellegrino, theorized that these individuals were Jesus, his wife Mary Magdalene, their son Judah, and Jesus’ mother Mary. Mary Magdalene as the first to find the tomb empty. Finally, the testimony of all four Gospels that Mary Magdalene (along with other women) was the first person to discover the empty tomb is another embarrassing detail that the Gospel writers would not have invented if they were making up or repeating fictional stories. Not only was she a woman—which in the patriarchal culture of the first century would have lessened respect for her testimony—she was reportedly a former demoniac (Luke 8:2). These four points, taken together, form a strong argument that the Gospels’ accounts of the empty tomb were based on fact. Fact #4: Some of Jesus’ disciples were convinced they saw him alive after his death on the cross. It is a fact that not long after Jesus’ death on the cross, some of his disciples had experiences that they were sincerely convinced were encounters with Jesus resurrected from the dead. Notice that in putting it this way, I am not begging the question; that is, I am not assuming that Jesus was really raised from the dead or that the disciples really saw Jesus. All I am asserting here is that some of the disciples sincerely believed they saw Jesus alive from the dead. Whereas it is not surprising that scholars generally agree that Jesus existed and died on the cross, it may seem surprising that non-Christian scholars also commonly acknowledge that some of Jesus’ disciples had experiences that they thought were encounters with the risen Jesus. The reason for the widespread agreement on this matter is that the testimonies to these experiences are early, multiple, independent, and credible. The passage is written in the very stylized form (“that Christ died…that he was buried…that he was raised…that he was seen”) of a confession or short creedal statement. Specifically, the use of the word “that” (Greek, hoti) after words about teaching or knowing sometimes introduces short affirmations or confessional statements, such as “know that there is no God but one” (1 Cor. 8:4; see also James 2:19) and “confess that Jesus is Lord” (Phil. 2:11). Paul says that the Corinthians “received” what he had “handed on” to them after he had “received” it, language that refers to teaching (good or bad) that is transmitted from one source to another (e.g., Mark 7:3-5; 11:23; Gal. 1:9-14; 2 Thess. 3:6). Such teaching might be “received” from God or Christ (as in 1 Cor. 11:23; Gal. 1:9-12) or from other people (as in 2 Thess. 3:6). Paul emphasizes at the end of the passage that he had preached the same message as the other apostles (1 Cor. 15:11). Multiple independent testimonies to the appearances. The fact that Paul’s list of appearances originated extremely early is not the only reason scholars are almost all convinced that some of Jesus’ followers had such experiences. Paul is not our only source for the fact of these appearances. We also have accounts of Jesus appearing to various individuals and groups in the Gospels. What is interesting about these accounts is that they clearly were not based on Paul’s list (and Paul’s list just as obviously was not based on the Gospels, which virtually all scholars date after 1 Corinthians) and yet Paul and the Gospels corroborate each other on several (not all) of the appearances. The following table shows the similarities and differences between Paul’s list and the Gospel accounts at a glance. Paul mentions two appearances not found in the Gospels (to the 500 brethren and to James), while the Gospels mention appearances not found in Paul (to Mary Magdalene and the other Mary, the eleven in Galilee, and Clopas and his companion). Both Paul and Luke mention an appearance of Jesus to Peter, although Paul calls him Cephas and Luke calls him Simon as well as Peter. Paul and John refer to the first appearance to a group of apostles as an appearance to “the Twelve,” whereas Matthew and Luke call this group “the eleven” because Judas had betrayed Jesus and was no longer one of the apostles (a fact John knows, see John 18:2-5). It is clear from John 20:24-29 that “the Twelve” was used as a technical term for the group of apostles that normally had twelve members, even if not all of them were present, since John refers to the Twelve and then mentions that Thomas had not been with them the first time. It is interesting to note that Paul and John both mention two appearances to groups of apostles, with the second appearance having all of them. The three Gospels also appear to give accounts of Jesus’ appearances that are independent of one another. The differences are such that, somewhat notoriously, they are difficult (though not impossible) to harmonize.17 Yet we have two Gospel accounts that report an appearance to Mary Magdalene and two accounts that report an appearance to the apostles. The accounts in Luke and John emphasize the physical nature of Jesus’ bodily resurrection. Secular scholars tend to be skeptical about the details of these accounts. However, the accounts are clearly independent: Both report Jesus appearing to the disciples in Jerusalem but from differing perspectives; in addition, Luke reports Jesus appearing to Clopas and his companion, whereas John reports Jesus appearing to Mary Magdalene. Yet Luke and John both report that Jesus’ followers were able to touch him and to see his hands and feet where his body had been nailed to the cross (Luke 24:39-40; John 20:20, 25-27). Both Gospels also report Jesus eating fish with his disciples on different occasions (Luke 24:41-43; John 21:9-15). The independent, interlocking nature of Paul’s list and the Gospels’ accounts of appearances to Jesus convinces a near consensus of scholars that at least some of these appearances were genuine experiences—however the scholars might try to explain them (and some don’t even try). Two of these appearances are widely regarded as essentially certain facts: the appearances to Mary Magdalene and Simon Peter.18 Besides the independent accounts of these appearances, they are simply very difficult to explain away as fictions invented by the early church. 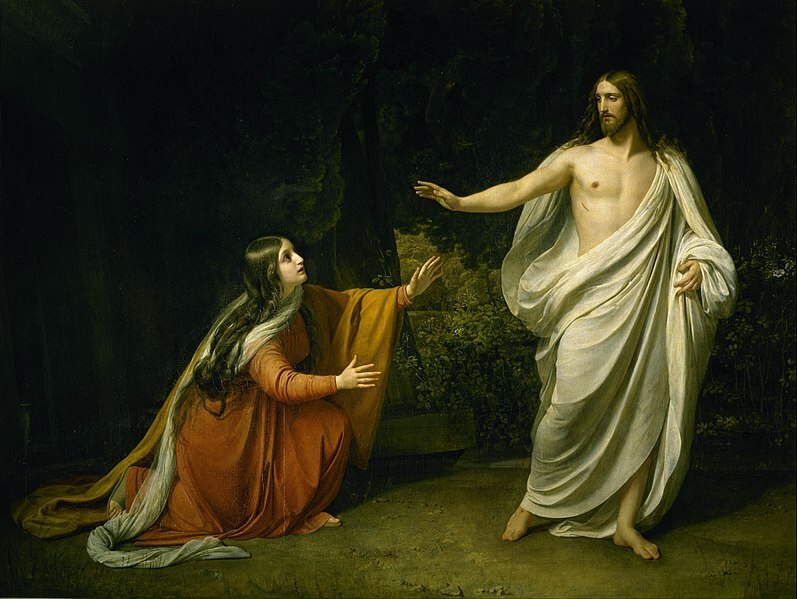 As with the accounts of the discovery of the empty tomb, it is extremely difficult to explain why anyone would make up the story that Mary Magdalene was the first eyewitness to see the risen Jesus. Peter’s experience of seeing the risen Jesus is independently attested in Paul (1 Cor. 15:5) and Luke (Luke 24:34) and is also implied in Mark (Mark 16:7). Almost all scholars agree that Mary and Peter had such experiences even if they don’t agree that Jesus had actually risen from the dead. Something must have happened to spark the movement after Jesus had been crucified, a humiliating death that would have dashed the disciples’ hope that he was their Messiah (Luke 24:19-21). Paul: From zealous persecutor to apostle. In addition to the appearances to Mary Magdalene and Peter, which practically all scholars accept as facts, we must take into consideration Paul’s experience of seeing the risen Jesus. In this case we have Paul’s firsthand written testimony to his experience in his epistles. Paul’s most detailed firsthand account is in Galatians 1, written between about AD 48 and 54 (about fifteen to twenty years after Jesus’ death).19 Paul states repeatedly and emphatically in his epistles that the risen Christ appeared to him and commissioned him to be an apostle (Gal. 1:1, 11-16; 1 Cor. 9:1-2; 15:8-9; Rom. 1:4-5). Prior to his experience of seeing Christ, Paul had aggressively persecuted followers of Jesus, a fact he admits with shame, even though he had done so out of sincere religious conviction that the Jesus movement was contrary to the Mosaic Law (1 Cor. 15:9; Gal. 1:13-14; Phil. 3:5-6). The experience of seeing Jesus transformed Paul. He devoted himself to the radical venture of inviting Gentiles to become members of the covenant community of believers in Jesus the Jewish Messiah without requiring them to practice the Jewish religion. Paul insisted that Gentile converts did not need to practice the religious, ceremonial, and dietary requirements of the Law of Moses. Most particularly, Gentile male converts did not need to be circumcised. Such a mission was antithetical to the strict, exclusivist Judaism in which Paul was reared and educated. Something must have happened to turn the Pharisee into the apostle to the Gentiles. The only plausible explanation is that he had the experience he reported having of Christ appearing to him.20 This is why even secular historians universally acknowledge that Paul sincerely thought he had seen the resurrected Jesus. When we bring these facts together, we find that the Resurrection is the only cogent explanation of the facts. The theories that the disciples stole the body or that the body was simply moved from one burial location to another cannot explain the multiple appearances of Jesus to his disciples—and certainly cannot explain the later appearance of Jesus to Paul. The theories that the disciples experienced hallucinations or some kind of subjective visions are unable to account for the fact of the empty tomb. The only plausible explanation that fully accounts for all of the facts is that Jesus did indeed rise bodily from the dead. 1. Robert M. Bowman Jr., “Did Jesus Exist?” (Cedar Springs, MI: Institute for Religious Research, 2017). 2. Bart D. Ehrman, Did Jesus Exist? The Historical Argument for Jesus of Nazareth (New York: HarperOne, 2012), 4. 3. Joel B. Green, “The Death of Jesus,” in Handbook for the Study of the Historical Jesus, Volume 3: The Historical Jesus, ed. Hólmen and Porter, 2383 (2383–2408). 4. Robert M. Bowman Jr., “Did Jesus Die on the Cross?” (Cedar Springs, MI: Institute for Religious Research, 2018). 5. Jodi Magness, “What Did Jesus’ Tomb Look Like?” in The Burial of Jesus, ed. Kathleen Miller, et. al. (Washington, DC: Biblical Archaeology Society, 2007), 8. 6. Bart D. Ehrman, How Jesus Became God: The Exaltation of a Jewish Preacher from Galilee (New York: HarperOne, 2014), 154–55. According to Ehrman, this legend developed in two stages: first the burial was attributed to the Sanhedrin as a whole, and only later to Joseph of Arimathea. His argument for this claim is extremely flimsy, but if it were correct it would mean that the account of the burial by the Sanhedrin originated even earlier than any of the Gospels. 7. Simcha Jacobovici and Charles Pellegrino, The Jesus Family Tomb: The Discovery, the Investigation, and the Evidence that Could Change History (New York: HarperSanFrancisco, 2007); The Lost Tomb of Jesus, dir. Simcha Jacobovici, exec. prod. James Cameron (Discovery Channel, 2007; DVD, Port Washington, NY: Koch Vision, 2007). 8. This explains why there are at least five women in the New Testament named Mary: Jesus’ mother; Mary Magdalene; Mary of Bethany; Mary the mother of James and Joses; and Mary of Rome. 9. François Bovon, “The Tomb of Jesus,” SBL Forum (posted March 2007). 10. Gary R. Habermas, The Secret of the Talpiot Tomb: Unraveling the Mystery of the Jesus Family Tomb (Nashville: B&H, 2008); Buried Hope or Risen Savior: The Search for the Jesus Tomb, ed. Charles Quarles (Nashville: B&H Academic, 2008); The Tomb of Jesus and His Family? Exploring Ancient Jewish Tombs Near Jerusalem’s Walls, Fourth Princeton Symposium on Judaism and Christian Origins, ed. James H. Charlesworth (Grand Rapids: Eerdmans, 2013); Craig A. Evans, Jesus and the Remains of His Day: Studies in Jesus and the Evidence of Material Culture (Peabody, MA: Hendrickson, 2015). 11. Michael Grant, Jesus: An Historian’s Review of the Gospels (New York: Charles Scribner’s Sons, 1977), 176. 12. E. P. Sanders, The Historical Figure of Jesus (London: Penguin Press, 1993), 280. 13. For a list of some fifty biblical scholars who acknowledge this and other basic facts pertaining to the Resurrection, see Gary R. Habermas, The Risen Jesus and Future Hope (Lanham, MD: Rowman & Littlefield, 2003), 50-51 n. 165. 14. E.g., Hans Dieter Betz and Margaret M. Mitchell, “Corinthians, First Epistle to the,” in Anchor Bible Dictionary, ed.-in-chief David Noel Freedman (New York: Doubleday, 1992), 1:1140. 15. C. H. Dodd, The Apostolic Preaching and Its Developments (New York: Harper & Row, 1964), 16. 16. See the long list of citations in Michael R. Licona, The Resurrection of Jesus: A New Historiographical Approach (Downers Grove, IL: InterVarsity Press, 2010), 234 n. 140. 17. See John Wenham, Easter Enigma: Do the Resurrection Accounts Contradict One Another? 2nd ed. (Grand Rapids: Baker, 1993). 18. Ehrman, who reduces the number of visions of Jesus to what he thinks is the bare minimum, acknowledges the experiences of Mary Magdalene and Peter: Bart D. Ehrman, How Jesus Became God: The Exaltation of a Jewish Preacher from Galilee (New York: HarperOne, 2014), 192. 19. On the date of Galatians, see Thomas R. Schreiner, Galatians, Zondervan Exegetical Commentary on the New Testament 9, gen. ed. Clinton E. Arnold (Grand Rapids: Zondervan, 2010), 22-29. 20. This argument is developed in detail in Daniel P. Fuller, Easter Faith and History (Grand Rapids: Eerdmans, 1965), 208-29. 21. See further Joseph W. Bergeron and Gary R. Habermas, “The Resurrection of Jesus: A Clinical Review of Psychiatric Hypotheses for the Biblical Story of Easter,” Irish Theological Quarterly 80/2 (2015): 157–72; Jake O’Connell, Jesus’ Resurrection and Apparitions: A Bayesian Analysis (Eugene, OR: Resource Publications, 2016).